The Silicon Valley Real Estate market continues to show historically low inventory levels causing a bidding frenzy for Buyers. Taking Santa Clara County as a prime example, there are 58% less Condominiums and Townhomes for sale and 46% less Single Family Homes for Sale than the same time last year. 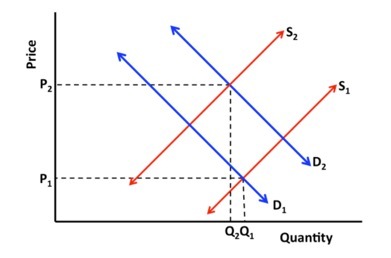 The most fundamental principles of Supply and Demand in Economics are on full display in this market. With a low Supply of homes reducing the Quantity of homes (S1 -> S2) available, coupled simultaneously with an increase in Demand (D1 -> D2), is the root cause of Buyer bidding wars. In short, if you are a Seller you have a major opportunity to attain record setting prices on your home. If you are a Buyer, you will need to have a strong plan of attack plan and be extremely aggressive in your home bids to beat out other Buyers in this very cut-throat market. Despite the Federal Reserve raising interest rates, mortgage interest rates have remained steady. Jumbo Loans have been seeing near record lows this year. Buyers flooded the market this year in anticipation of a rate increase, but have been pleased to find steady and low interest rates which continue to fuel real estate price increases. With the stock market continually hitting record highs, this seeds a key component to funding local homebuyers’ purchases. Cash Buyers from abroad have screeched to a grinding halt, as Governments continue to control the inflow and outflows of funds. The key economic indicator in our market is the health of the Technology sector. Although there have not been any recent notable Initial Public Offerings (IPO’s), with the stock market hitting records highs, Technology stock values are continuing to increase in value. These makeup the foundations of the down payment for homes and enable Buyers to be competitive in the marketplace. The Technology sector does not show any signs of slowing down this year or next. Furthermore, although there has been an outflow of the California population to areas such as Seattle, Denver, Portland and various cities in Florida, there is a healthy in-flow of Technology workers and the Technology sector continues to hire. The crux of the issue is that Sellers do not know where to go and how to avoid a homeless period during the exchange process. Few have enough funds to buy a home outright before selling, as much of their down payment lie in the equity of the home that they currently live in. Secondly, moving means an increased property tax amount, which is another burden that is difficult to accept. Also with increasing prices, Sellers are opting to stay put in the home they already have if there is no need to move and pay higher prices. Coming up with complex project plans have become paramount in order to help Sellers move to their next home. There are creative strategies, advanced planning and project management skills to create as stress free a transition as possible. With latest news of Googles Downtown San Jose campus, coupled with Adobe’s expansion, Downtown San Jose is positioned to be the next hottest location in the Silicon Valley. Though the campus buildout is still underway, excitement has already begun in what is likely to be a hot location in years to come. As more Technology workers are hired, traffic has become a major concern around the Silicon Valley. This makes the old cliché of Location, Location, Location even more true. With the opening of the Apple Spaceship and expansions of Google and Microsoft/Linkedin into the city of Sunnyvale, this has caused a spike in demand for housing in the city. The Sunnyvale market is the hottest market to date with homes selling 11% to 19% over list price in an average of 13 days. There has been a major shift in the last few years in the Valley. Traditionally families considered a school with the highest scores to be the desired school to purchase a home in. Since the Palo Alto Caltrain suicides, our thinking about sending our children to the top-rated schools have shifted. More and more families are opting not necessarily to have the best schools but seek balance for their children outside of simply academics. For those of you familiar with the market a great school will cost more initially but also retain its’ value in the long run. Also for those of you monitoring real estate closely will know that homes will sell over list price. Below is a sample of the most popular areas in the Valley, their Average Sale Prices, the Percentage the Sold Over List Price and the Average Days on Market. We are approaching the fall and winter seasons where the market tends to hit a seasonal lull with reduced inventory levels along with lower price levels. Given the low amount of supply this year and the increased amount of demand from home buyers, we are not sure that there will be a price dip this fall or winter season. There appears to be enough demand to carry us well into 2018 and onward. Looking forward to 2018 we believe that there maybe more inventory hitting the market, but likely not enough to satisfy the current demand. As long as the Technology sector continues to be strong, price will likely continue to rise in the short run. We wish you the best in this fourth quarter to close out the year! 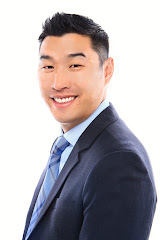 Alan is the Founder of the Alan Wang Realty Group at Keller Williams and has been in the Real Estate industry helping clients for over 14 years. Previously he was also in the Technology industry for over 13 years. He is passionate about helping families achieve their real estate dreams! As someone who does not really understand real estate, I don’t understand most of this post. I’ll share this with someone who writes about real estate. Thanks for the information and links you shared this is so should be a useful and quite informative nexter.org this is also a good blog for news !! If you want to get updated of the real estate markets then, this blog is right for the investors to get the details. To know more about the real estate visit homes for sale Queens NY will help you to find beautiful houses.